A stroke of paint can be much more than a simple swatch of color: it can have a wet gloss, a rippled surface, and seep into the canvas below it. Ambient Design brings these subtleties to ArtRage 3.0.5, a painting app that mimics the nuances of natural media such as ink, charcoal, and paint. Two versions of the application are available: ArtRage Studio Pro ($80, reviewed here) and ArtRage Studio ($40), a pared-down variant that lacks a number of advanced brush and tool controls. ArtRage 3’s toolset includes items such as oil and watercolor paint brushes, ink and felt pens, and pencil, crayon, and charcoal. Each tool has been carefully crafted to match its real-world counterpart; for example, a stroke with the watercolor brush is lighter in the middle and richer at the edges. The application also takes into account the wetness of the paint and the grain of the canvas you’ve chosen, so in the case of the watercolor brush, the paint bleeds into contours of the canvas. Draw a stroke of a different color across your current stroke and the paint blends together, the colors combining as they would on a real canvas. Tool settings let you adjust the wetness of the paint, as well as how quickly the paint thins and how much paint is on your brush. 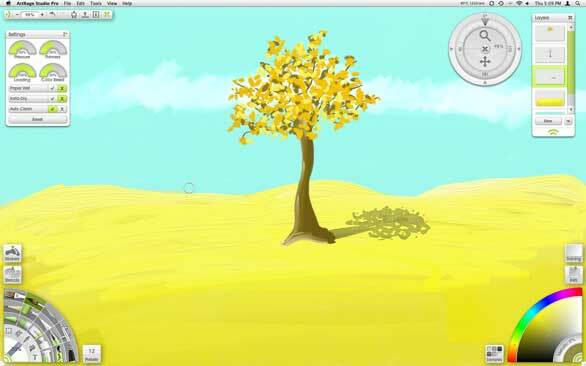 You can use ArtRage 3 with a mouse, but a graphics tablet will produce the most natural results. There are distinct benefits to painting on a digital canvas—and one of them is being able to quickly correct mistakes and freely experiment with your creations. ArtRage 3 aids this process by offering unlimited undos, so you can back up and redo strokes as required, something many artists will appreciate. The application also lets you paint on layers, allowing you to isolate different elements of your artwork. (Additionally, ArtRage 3 documents can be exported, with layers, to Photoshop PSD and other formats, including JPEG.) And if you’re accustomed to twirling around your sketchbook to get a better angle, you’ll be happy to know that the application supports full canvas rotation. 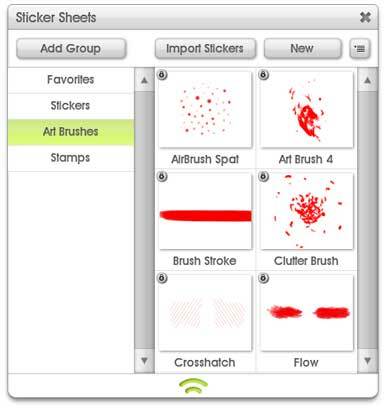 Stickers can be used to create custom paint brushes. Art Rage 3's Stickers is a new tool that lets you quickly create artwork using images on a "sticker sheet." As the tool sprays stickers onto the canvas, each sticker is mutated ever so slightly; in a few strokes, you can create a detailed field of wheat or sky full of snowflakes. Stickers distinguishes itself from other graphic hose tools with its advanced options, allowing you to control not just the scale and rotation of each sticker, but also variances in hue, saturation, luminosity, and shadow. It's a powerful tool, if wielded skillfully. One of ArtRage 3’s most striking characteristics is its interface, which sidelines standard gray windows in favor of clean white elements with a subtle color highlight. It’s glossy and gorgeous, but a bit of a mixed blessing. In the lower left you’ll find the toolkit with clear, detailed icons; in the lower right, a cleverly designed color picker. Each of these fan-shaped panels is flanked by large square icons that trigger settings panels. These elements are oversized and can obscure your view of the canvas, but you can summon a Clean Canvas mode at any time by pressing the Return key. Unfortunately, most panels also use non-standard scroll bars, radio buttons, and resize icons, which can be a bit disorienting. Niggling issues with the interface go beyond the surface. The main menu needs an overhaul; for example, color, stencil, and layer options are currently (and inexplicably) filed within Tools. Another annoyance is that the application processes an activation click as a brush stroke, meaning each time to you switch to another application (say, to check your email) and click back to ArtRage 3, that first click will drop a blob of paint on your canvas. It’s easily remedied by choosing Undo, but it’s unnecessary. ArtRage Studio Pro lets you pick up a virtual paintbrush and create a masterpiece on a digital canvas. Its interface may take some getting used to for Mac users. ArtRage 3 also claims to support Wacom tablet-specific multitouch gestures, but for the moment, the feature is heavily flawed. Canvas rotation is unruly and lags well behind your gestures, and zooming in and out is so slow and incremental as to be unusable. The developer acknowledges these issues and says he will address them in the next maintenance update. More disappointing still is the fact that ArtRage does not yet support multitouch control via the MacBook Trackpad, a problem the developer says may be corrected only when the application is rewritten in Cocoa (OS X’s optimal programming environment). Comparisons to Corel's Painter Essentials ( ) ($50) and Painter 11 ( ) ($399) are unavoidable. ArtRage Studio Pro 3.0 offers significantly more brush control than Painter Essentials and, in terms of its feature set, is much closer to Painter 11. Unfortunately, ArtRage 3.0 can't quite match Corel's products in performance. Brush speed is generally good, but it's not exceptional. Quite a few brushes (particularly the paint roller) seem to overwork the processor, and there can be a noticeable lag between the motion of the cursor and the paint appearing on the canvas. Painter's brushes are almost always instantaneous (with some key exceptions); as a result, drawing and painting feels more natural. ArtRage Studio Pro 3.0.5 does an excellent job of recreating the subtle nuances of natural media on a digital canvas, and it's easy enough to learn and use quickly. Although it has a number of interface quirks and some brushes can be slow, it’s certainly worth considering if you’re a traditional artist looking to trade in your messy paint tubes for a tablet.